HERE is a superb volume, Brushing the past : later Chinese calligraphy from the gift of Robert Hatfield Ellsworth by Joseph Chang, Thomas Lawton and Stephen D. Allee. This is the catalogue from an exhibition held at the Freer Gallery of Art, Washington, D.C., Apr. 30, 2000-Jan. 2, 2001. Below is a close up of a single character from a Qing dynasty couplet in running script by Jian Ren (1743-1795). 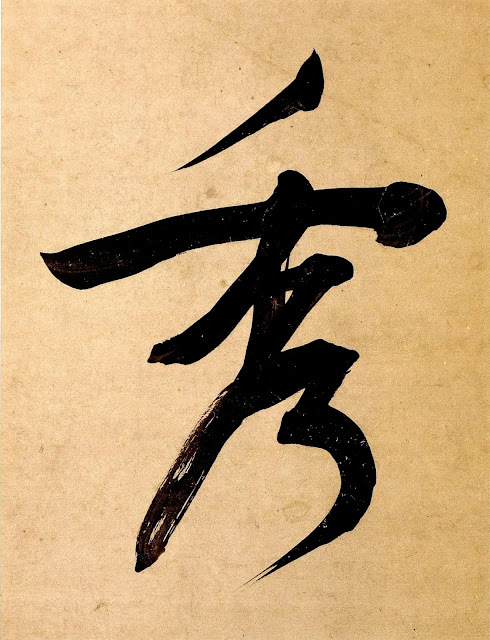 The original calligraphy is on a pair of hanging scrolls in ink on gold flecked paper. In five colors each, sacred mushrooms blossom as big as a fist.